There is something really cool about working with a vendor that is passionate about their product. Dan Mullins from Windows Express is one of those people. He is a great guy that offers an excellent product at a very fair price. More importantly, he really seems to love what he does. I mentioned before about how that was one of the things that we liked most about Craig. Dan falls into the same type of person. So we bought our windows. Our first real purchase for the house. We were over budget, but only by about 15%. Not the end of the world and we think that we can make it up in our cabinet allowance. If not, we may have to downgrade on the flooring or some of the appliances. Since appliances seem to have a better ROI were we to sell the house in a few years, we may have to shave a couple of dollars a foot off of our flooring budget. 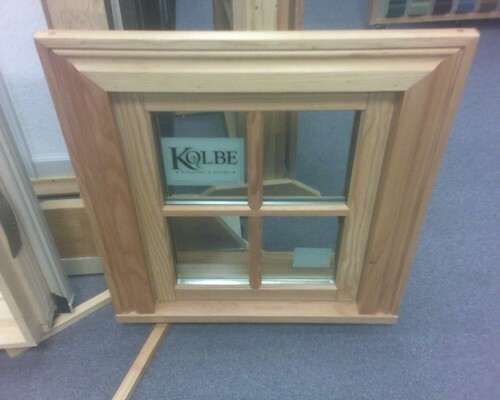 We ended up getting the wooden Kolbe & Kolbe’s. We love the way that they look and have friends that also have them and can’t be happier. Per Dan’s recommendation, we went with a smoked, vinyl clad window in the shower in order to not have to deal with wood rot in a few years. I went by the house today to check on the status of the demo. The fireplace has been extracted from the house and there is a huge hole in the wall where it used to be. Most of the rooms are down to bare studs now. It is really interesting to see the methodology that has been going into the demo. They’ve also started to dig up things like the garage foundation and some of the brick patio that was in the back. This will be done in order to make way for the new foundation that will be poured shortly. I hope to get more pictures tomorrow. Thank you so very much for your kindness. I thought you and Holly were very nice people and your kids very well behaved. You, Holly and the kids are welcome at our showroom anytime !